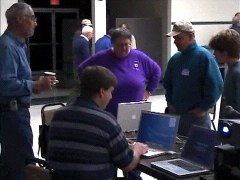 December 18, 2003: SBMUG members Pia Oliver, Becky Davis and Harold Adams showed us how they use their Macs as indispensible parts of their businesses. Pia works for Randall House, a dealer in rare books and fine art. Pia has set up FileMaker Pro databases of inventory, clients, dealers, libraries and universities. A PowerBook with a copy of the database goes with Pia to book fairs, with sales tax calculations adjusted for the county the fair is in. On return, the main database is synchronized with the copy on the PowerBook. 75% of sales are now by way of the Internet. The store gets lots of queries by e-mail; descriptions from the inventory database are copied into replies in Eudora, using an AppleScript written by SBMUG member Brian Carlin. Other scripts work with Dreamweaver to generate web pages for the Randall House web site, where digital photos of requested books and art can be posted for prospective customers to see. Becky told us how she uses her “low-end” Mac system for Custom Cartridge, a family-owned manufacturer of precision ammunition. Becky uses her “beige” G3 to design and print numerous forms, brochures, labels and advertisements, which have such a professional appearance that customers think Custom Cartridge is a much larger company! Becky also uses a database created by SBMUG member Dirk Reynolds. Because of the specialty nature of their product, Becky created a video with Harold’s help to demonstrate the advantages of precision ammo. Using only iMovie, it took Harold just three days for shooting, editing and titling the video. Harold talked about his business, SBLIFE.COM, which makes promotional videos to showcase places and businesses in Santa Barbara, and we saw the short SBMUG video he made featuring scenes from the November meeting. Dirk Johnson meets with SBMUGers. •Use keyboard shortcuts to open special folders (Shift-Command-U for Utilities folder). •See the entire directory structure in a Finder window (Command-Up Arrow). • Create your own keyboard shortcuts for applications and the Finder. •Exposé (enabled in Preferences) shows thumbnail images of all open windows with the press of an activation key. •Trashed files can be erased seven times for government-level security. • Contents of the Home Folder can be encrypted automatically by File Vault. •Preferences can be password-protected. • Mail now supports secure encrypted e-mail. •Mail can now sort messages by thread. • iDisk synchronizes automatically now, and much faster than before. • Network Preferences shows network conditions in real English! • Check spelling in any application that uses OS X’s text services. • Add plug-ins to Calculator, such as graphing functions and expressions worksheet for text-based calculating. •Keyboard Viewer (in Preferences, International pane) replaces the Key Caps desk accessory. • Finder is AppleScript recordable again. • Screen-capture modes include copy to clipboard; take a picture of a window or the menu bar (Command-Shift-4 and Space Bar). Open the PDF in Preview and export it as another graphic type. • Preview can select text in PDFs (for copy & paste to other documents), and can search text and display a list of results…. October 16, 2003: MacFixIt editor Bob DeLaurentis showed us how to back up our data and maintain a trouble-free Macintosh, beginning with a brief presentation on general strategies and followed by demos of Retrospect and Web Confidential. For troubleshooting guides Bob recommends Sad Macs, Bombs and Other Disasters 4th Edition (for OS 9 users), and Mac OS X Disaster Relief, both by Ted Landau. Every month or two, check all your hard drives for corruption, using a disk utility such as Disk Warrior or the disk utility on the Macintosh System CD. A good first line of defense is to boot into single user mode by restarting while holding down Command-S, then typing fsck -y from the command prompt. Once complete, type restart. Whenever the system behaves strangely, repair Disk Permissions on the startup disk with Apple’s Disk Utility. It’s also a good idea to repair permissions before and after installing a new application or system update. If that doesn’t work, revert to a backup copy of the system or use Archive and Install to reinstall everything anew (similar to OS 9’s Clean Install). Use caution however, this step requires you to rebuild your home folder, including application preferences and support files, by manually copying them from the previous home folder. Bob emphasized that “backups are the only 100% solution.” Excellent backup applications include Dantz Retrospect Desktop Backup, Prosoft DataBackup (for both OS 9 and X), and Apple‘s .Mac Backup utility. Always keep an alternate startup disk on hand, such as a “bootable” CD or external FireWire drive. It’s also handy to install troubleshooting utilities and backup programs on the same alternate disk. If your Mac refuses to start up, use your alternate startup disk. Some newer applications such as iTunes and iPhoto use database files to index your documents, and those indexes can become corrupt in time. One way to preserve index data in iTunes is by having iTunes write the data directly into the music files. Select the MP3 files, and use the Contextual Menus to update the ID3 tags. Web Confidential is a $30 shareware program that keeps passwords, serial numbers, etc. on your Mac in 128-bit encrypted form. After encrypting your data, be sure to back it up and don’t forget your Web Confidential password! Carbon Copy Cloner can duplicate OS X disks exactly. Bob DeLaurentis is the former Senior Editor for MacFixIt.com and he currently writes about technology for the South Coast Beacon. His column, Tech Talk, appears weekly. He is also an active participant of SBMUG’s email discussion list. September 25, 2003: Mike Bishop of the MacMechanic in Santa Barbara, and Herb Wright of the Mac Shac in Goleta, showed us the brand-new, wickedly fast Macintosh G5. The presentation began with Mike showing the latest PowerBook and pointing out new improvements, then Herb gave us a presentation on the construction and features of the new G5. (This one had a clear plastic side panel so we could see the internal construction.) With its several fans for different “thermal zones”, each running only as fast as needed, the G5 is very quiet even when doing complex tasks in Photoshop. Only when the side panel was opened did the fans run at maximum speed. After that, Mac Shac’s Chris Graham had an on-line chat with us across the Internet from his home. We used Apple’s new iChat A/V software — “videoconferencing for the rest of us” — and the iSight camera with its built-in microphone for two-way video and audio. iChat features high-quality full-duplex audio, which means voices can travel in both directions at once, as with a telephone, instead of one voice blocking another. 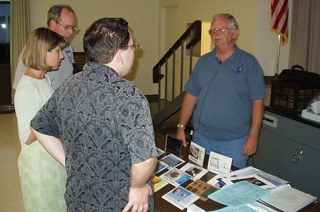 August 28, 2003: Don Baker of Klassic Specialties returned to explain papers, ink cartridges, and the latest printer technology. We learned about the different types and brands of inkjet printers, ink cartridges, compatible inks, and refill kits, and how to keep those Epson print heads from clogging. Do you know how many nanoliters of ink it takes to print a dot on a sheet of paper? Don does! Don also taught us about the different kinds of paper and what papers work best for different print jobs. As usual, Don’s presentation was lively and fascinating. And as usual, Don brought along ink cartridges and papers to sell at discount prices, and supplied us with five packages of papers for our drawing. Thanks, Don! July 10, 2003: Paul Norton gave us a tour of InDesign, Adobe’s page layout program for professional and semi-professional publications. InDesign is Adobe’s direct challenge to QuarkExpress, the currently dominant page layout program. InDesign integrates seamlessly with Illustrator and Photoshop for incorporating graphics and photographs, imports text from MS Word, and exports Adobe PDF, EPS, HTML, XML and other kinds of files — even “low resolution” files for e-mail newsletters. InDesign has a number of features of special interest. Text can be given “optical” alignment, a technique used by specialty traditional printers in which hyphens, periods and other small punctuation at the end of a line are moved into the margin to give the block of text a more uniform appearance. InDesign also can also adjust word space for more uniform spacing. Instead of adjusting spacing line-by-line, InDesign adjusts word spacing for the paragraph as a whole, reducing variations from line to line. June 26, 2003: Have you ever wanted a Mac-compatible remote control for PowerPoint or Keynote presentations? Want to control your DVD Player or iTunes from your sofa or bed? Or use AppleScript to control anything you like? The Clicker application running on the Mac displays a panel on the right containing scripts for specific functions. When dragged into the “actions” panel on the left they become menu items on the phone’s display. For example, Donald controlled iTunes, selecting tracks, adjusting volume, pausing, etc. Any AppleScriptable application (and there are getting to be more and more of them) can be controlled this way. Actions can even be set to happen automatically when the phone goes out of Bluetooth’s range (pausing iTunes and starting a screen saver, for example) or comes back into range (synchronizing files with iSync). Before the presentation, Brian Carlin handed out a handy list of OS X keyboard shortcuts for Startup Options, Safari web browsing, Handicapped Access features, the Finder and general-purpose uses. Click this link for OS X Keyboard Shortcuts, in PDF format. 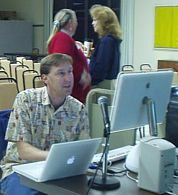 May 22, 2003: Jeffery Morse, Apple Certified Final Cut Pro Instructor, showed us how he makes digital edits, transitions, animated titles, and audio voice-overs of a documentary on-the-fly with Apple’s Final Cut Pro. This Emmy-Award-winning broadcast-quality video editor is perfect for your corporate sales event video or your next TV commercial. Jeffery also showed us the differences between Final Cut Pro and the more limited, but budget-friendly Final Cut Express. 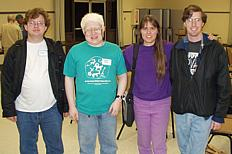 May 1, 2003: Our “April” meeting was a couple of weeks late, but as interesting as ever, as Susan Carty showed us what’s new about search engines and search directories. With the help of her husband Bob, Susan showed us how to get the best out of our searches. Even if you missed the meeting, you can get your own copy of Susan’s handout “Sites for Searchers” (PDF file), which gives brief descriptions of 16 different search sites and what’s special and different about each. Included are the popular Google, AltaVista and Yahoo sites, as well as specialized sites, personalized sites, and sites that use combinations of search engines. Susan’s “Fifteen Cool Searching Tips” (PDF file) explains the differences between a search engine and a directory, how to choose your search terms for the best results, tips on searching for proper names and phrases, using “wildcards” and “booleans”, and lots more. Finally, remember these three cardinal rules about searching: 1. Not everything is on the Internet. 2. Not everything that’s on the Internet is accurate. 3. Not everything that’s indexed is on any one search engine. Members of the SB Linux Users Group visit SBMUG. Donald is second from left. March 20, 2003: Linux evangelist and Mac user Donald Burr showed us how easy it is to run Linux on the Mac. Why would you want to, you ask? Especially since the advent of OS X? The short answer: to take advantage of the many programs written for Linux, and to take advantage of Linux’s inherent stability and speed on older Macs that can’t run OS X. When Apple set out to design Mac OS X, they made a remarkable decision: they chose to redesign the Mac operating system from the ground up, using the industrial-strength UNIX operating system as its core. UNIX is well-known for its high performance, solid-as-a-rock stability, and general robustness. It is also well-known as a phenomenal software development platform, with literally thousands of freely-available, ready-to-run applications out there. Although UNIX was originally a commercial product, the powers of UNIX are now freely available thanks to two projects — Linux and FreeBSD. Apple chose FreeBSD to form the core of OS X. Thanks to FreeBSD, Mac users can now enjoy the legendary stability and robustness of UNIX without foregoing the simple yet powerful graphical user interface that Mac users are accustomed to. But what if your Mac can’t run OS X? Fear not! While Apple was busily incorporating FreeBSD into its new OS, the Linux camp has been busy too. Now Linux can run on Apple hardware as well. They even went a step further than Apple — Linux can run on many older Macs that Mac OS X can’t run on (including pre-PowerPC models). You don’t even have to give up Macintosh compatibility either — Linux features a system similar to OS X’s “Classic” mode that allows you to run your old familiar Mac applications side-by-side with Linux. February 20, 2003: This month Brian, Robert and Pia showed how you can put your own pictures on the web for family and friends to see. Brian Carlin showed how to put the pictures up using OS X’s terminal program and explained the various web page hosts you might choose from. You can get a copy of Brian’s handout here. Pia Oliver showed how she puts web pages together with Dreamweaver, a complete web page editor and web site management tool. While Brian did the typing in TextEdit, Robert Winokur showed how easy it is to get instant gratification writing your own web pages from scratch. Robert has prepared two lessons in web page writing: About Irish Coffee [PDF file] is a very basic web page that demonstrates the workings of HTML. In your browser’s View menu, select “Source” to see what’s in the HTML file. You’ll see comments there explaining how it works. From there it’s a simple matter to add pictures. 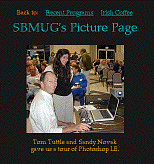 The SBMUG Picture Page [PDF file] has further explanations in its source. Soon you’ll have your pictures on your own web page! Harold gets his iMac set up before the show, with Anita and Pia in background. 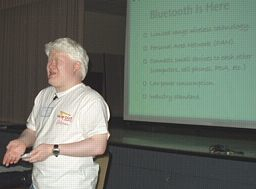 January 23, 2003: We started off the new year in our customary fashion learning what was new and exciting at Macworld Expo in San Francisco, with Ken Jurgensen leading the discussion. Ken also demonstrated Safari, Apple’s efficient new web browser still in Beta release; and George Tokarski of MacMechanic demonstrated Keynote, the new Apple presentation software that competes favorably with Microsoft PowerPoint. January is also the month of our annual board elections, and you can see the current “who’s who” on our Contact SBMUG! page.